There are times in our lives when it seems like we come full circle in our findings. This is one of those times for me. Early on in my research into the HPV vaccines I knew that the L-Histidine, which is unique to this vaccine, played a major role in what I was hearing from parents and girls adversely injured by Gardasil®. 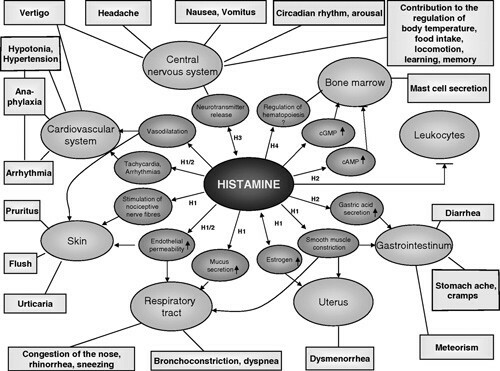 I made the connection between Histamine and IgE release. I was able to make the connection with all the variety of symptoms to the various components of this vaccine. Because of personal experiences, I found that the majority of the injured experienced an anaphylactic type incident. The adverse events experienced from the HPV vaccines nearly mirror those of an autistic child even down to the regression. Now I find that not only do the components of this vaccine play an integral part, but the main player in this scenario is the probable excessive histamine released because of injected L-Histidine. I suggest that every parent print a copy of this article to hand to their doctor when he or she suggests that their son or daughter be given the Gardasil vaccine. Of particular interest to me, my daughter has extreme migraines and her doctor has been trying to talk her into this Gardasil vaccine for the last year. Very pushy, very aggressive about it. Now that I have read this there is no doubt, definitely not ever. I am not sure what would have happen to her but from this article I would say it wouldn't have been good, maybe even terrible injuring. Thanks for writing this.